Just a quickie here as I won't be around over the weekend. Beautiful dd goes home today which makes me very sad. I hadn't realised what a hard time she is having with her diabetes: she's in the honeymoon period which is actuallly a horrible time as it means it's very hard for her to balance her sugar levels. She keeps hypo-ing which could lead to a coma if not recitified and sadly because she's in the honeymoon period, she can't always feel this is happening. Thank you very much to the staff in Marks and Spencers, Galway for finding her a seat so she could sit and drink lucozade when she had a major sugar crash, even though she had eaten well. Stitchywise, well hubby is still bad on his feet (and don't we all know it) so I've had to do everything so I haven't actually done very much stitching myself BUT Elaine, super stitchy model stitcher has sent back a photo of July. The photos are still not perfect but when they get home I will take photos of them all so I can get a truer image. Elaine has done a good job with the photo really which is a huge help! 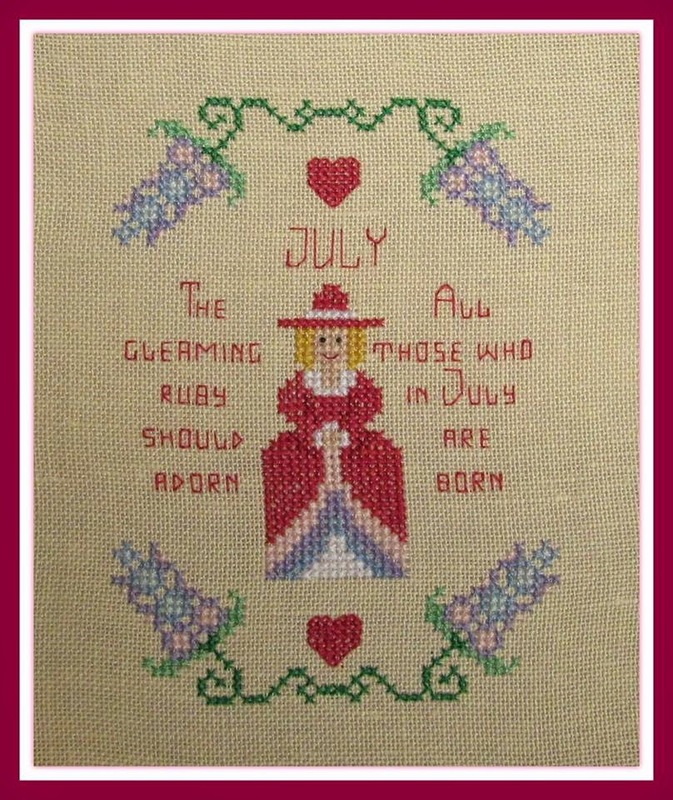 July features the birthstone which is a ruby and birth flowers, which are Hollyhocks. The Halloween SAL is going well. So far I have given those taking part three free charts. The second is the cat which forms part of a competition, Name That Cat, and the third which features a spider. You can't have Halloween without spiders can you? And the first one issued which has been stitched by the wonderful Kath Lang. It looks lovely. Well done Kath. I'm hoping to get a little stitching of my own done today...oh boy have I missed it. 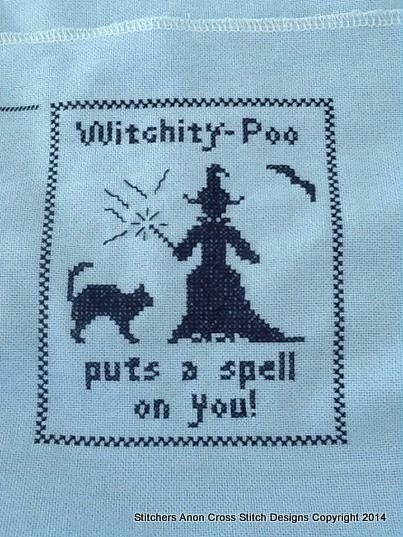 And I've sorted out fabric and threads for the Halloween SAL. Oh I am so excited! Love it. Can't wait! Cute design. I sure hope your daughter can get her sugar leveled out. So important for you daughter to get it straighten out. Hope everything goes well for her. Hope your daughter is able get her sugar numbers controlled. I LOVE your July design! I hope your daughter gets her sugar levels straightened out soon. That sounds a bit scary for you as her Mum. Such a nice little maid for JUly. It sounds somewhat scary what you tell about your daughter's diabetes. I hope that she and her doctor will soon find a means to control her sugar level better. How scarey for you mum, hope DD is soon feeling happier and able to cope better with the diabetes. Get well 'quickly' wishes to DH. Your SAL pieces look wonderful! If only I knew I would have the time to join in!